Who needs paper gift bags when you can sew up your own in no time! It’s nice to see that purse hardware has become more readily available in stores – put those purse locks to good use with this free quilted flap purse project. Relive the Great British Sewing Bee by sewing up this Drapy Knit Dress. This spring chick is perfect to add to quilt blocks or just stand along for potholders and coasters. Even though this isn’t a tutorial, I thought that this article on The Best Synthetic Dye for Lingerie Elastic was a helpful read. Now I want to dye my own materials! I simply adore this Brigitte Dress – it looks perfect for spring and has such a cute, nautical feel to it. Transform a men’s shirt into an off-the-shoulder button-up that’s perfect for spring. Last year Easton went through 7 pairs of jeans due to making giant holes in the knees. Now I know what to do with all those pants – make denim fabric baskets. Who needs Ipsy bags when making your own cosmetic cases are this easy? On a roll making bags? Then check out this this zippered pencil pouch (which would also make a perfect, small cosmetic case). I am a firm believer that one can not have too many oven mitts – mostly because I somehow burn the ends of my off before the first washing! Start your summer wardrobe sewing early by stitching up some new tank tops. A new length to a popular skirt style: this Midi Pencil Skirt looks like it will sew up in no time too! This entry was posted in Uncategorized on March 31, 2016 by stacy. With all the other sewing I’ve been doing, I bet you think I forgot about the “Family Fishouflage” project? With Bret and Easton’s set done, all I had left were shirts for Taylor and I…. guess what? They’re done! Since both of us had very different style demands (I wanted a simple ‘ringer’ style tee with cap sleeves, Taylor wanted a V-neck with short sleeves, but not cap) I used Jalie 2005 – which covered all the options we wanted. Now that they are done, I wish I would have gone with the v-neck too! The only drawback? 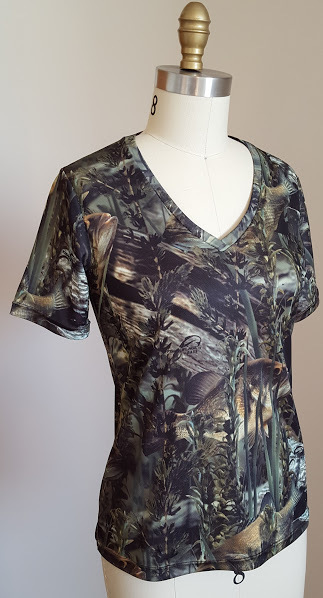 I could have gone up one size in both shirts- the material has just enough stretch to meet the pattern requirements, but it fits very snug (unlike the other tees I’ve sewn with this pattern). I can’t wait for all of us to wear out new shirts – this should make for some fun family photos! This entry was posted in Uncategorized on March 30, 2016 by stacy. In addition to the fun, in-the-hoop project that I showed you yesterday, I’ve been giving my BERNINA a workout by embroidering designs for an upcoming project for Creative Machine Embroidery. 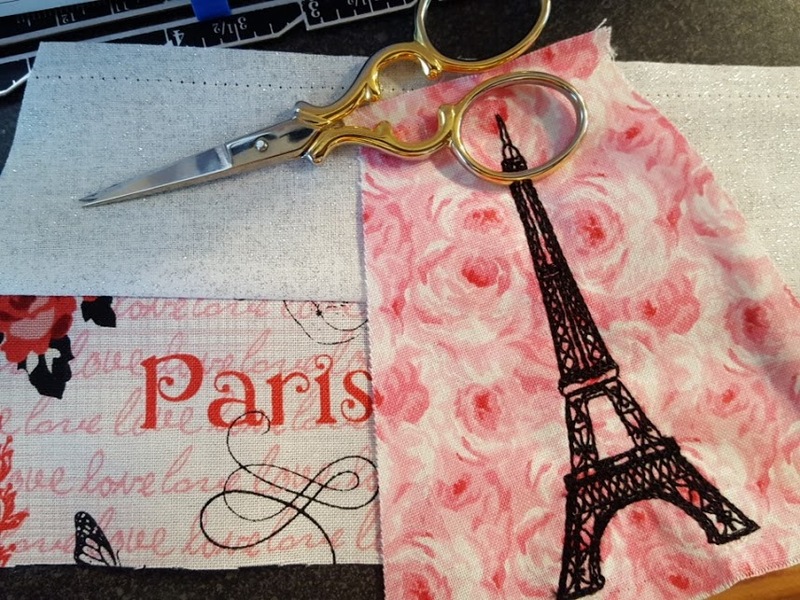 This was actually one of my favorite pieces – I not only love how the ‘theme’ came together, but I adore the black embroidery work on the soft pink, floral background (and seriously, who couldn’t love a mini Eiffel Tower?). Now to put the finishing touches on this project – I can’t wait to get to show you the end results! This entry was posted in Uncategorized on March 29, 2016 by stacy. After seeing so many people on social media making cute little stuffies for Easter, I suddenly decided (on Friday) I wanted to make some too! Nothing like a bit of last minute sewing, right? For this project, I decided to try out Dolls and Daydreams Embroidery Machine Bunny Rabbit Pattern. I picked this one because I am definitely intrigued by ‘in-the-hoop’ style projects (the entire doll is made with your embroidery machine) and the holiday gave me an excuse to try it out! My thoughts? Wow! I was able to make 4 rabbits in one afternoon\evening sewing session (with a break for egg dying and making dinner thrown in there as well)… I’m pretty sure I couldn’t do that with a standard sewing machine in the same amount of time. There’s lots of opportunities for customization too (besides the fabrics, you can add monograms, appliques, embroidery designs to the bellies). The stitching that is used to hold the dolls together is very tough too so I’m pretty sure there won’t be any chance of a popped seam either. Now the drawbacks. First off, you are limited in sizing by the hoops you own. 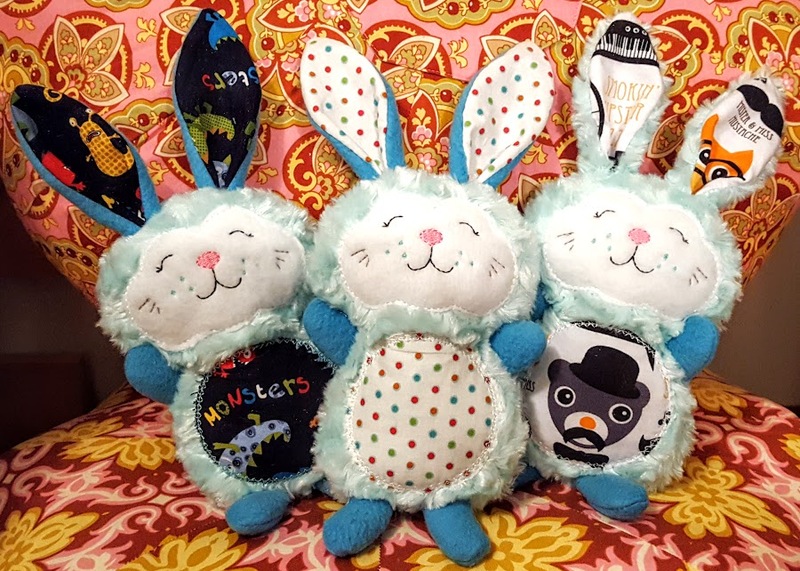 As much as I would have loved to make 10″ bunnies, my largest hoop is only big enough to make the 7″ tall stuffie – they’re cute (and were well received), but I personally would have liked them bigger. The ‘applique stitching’ isn’t necessarily what I would have selected either. While I would have liked a satin stitch, you have a choice between a ‘diamond stitch’ (what I used for the 3 rabbits above) or an ‘applique stitch’ (what I used for the photo on the left). I wound up cutting this one too close and the fabric popped loose while turning. As you can also guess, this project is also a little messy (with all that faux fur flying around, but who can resist it’s softness?) – so thoroughly cleaning your machine (and sewing area) is a must after you’re done! Overall, I love these little critters! Even with the drawbacks, will definitely plan on trying out more when the occasion rises (or just because) – it’s a great way to do more with your embroidery machine than just stitch out designs! This entry was posted in Uncategorized on March 28, 2016 by stacy. 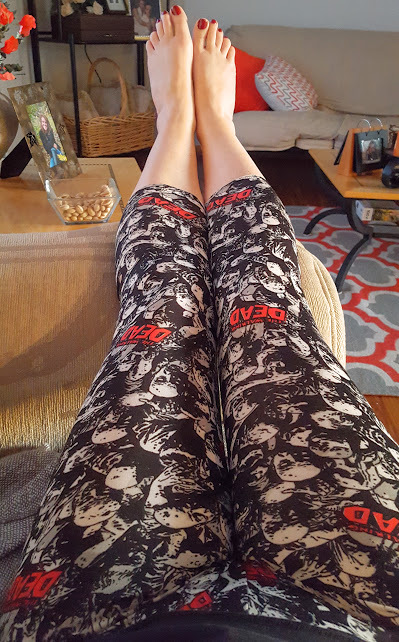 I’ve gotten a lot of miles out of Jalie 2920 – thank goodness that leggings haven’t gone out of style! On one of my more recent trips to Joann, I spotted a (knit) Walking Dead material and I couldn’t resist picking some up. I immediately decided that this material was destined to become a comfy, stretchy, lounging around the house pants (alright, I actually ran to the store yesterday in them, so maybe they’are not really house pants). Normally, I wouldn’t do a big write-up on a pattern that I’ve made several times. However, I wanted to point out that this particular material really only had great stretch going in one direction (the pattern calls for 4-way). I knew this going in, but forgot to compensate for the lack of lengthwise stretch when cutting…. and now they are capris. Thank goodness it’s turning warm out so I can get use out of them in this length! The moral of this story? : If you don’t have a 4-way stretch material, don’t forget to add extra length to your pattern if you want your leggings to hit your ankle! This entry was posted in Uncategorized on March 23, 2016 by stacy. 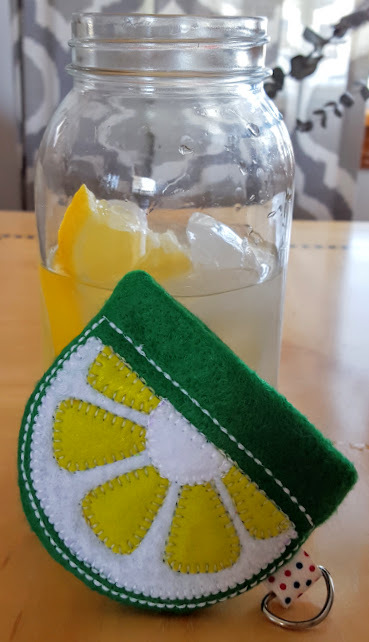 Nothing says spring like warm temperatures, fresh lemonade, and sewing projects that feel tropical! This weekend, I had the opportunity to sew up Betz White’s latest pattern, the Tutti Fruity Penny Pincher and I can’t wait to make more. In fact, I have to because Easton took this one so I no longer have a new, cute ‘coin purse’ for our swim bag this year! The patterns include instructions to make a lime wedge, pineapple, and strawberry change pouches that open and close with an internal flex frame (the kind that you pinch to open). The instructions are simple to follow and the little purses sew up very quickly – in fact, I am pretty sure you could make all 3 in one day. 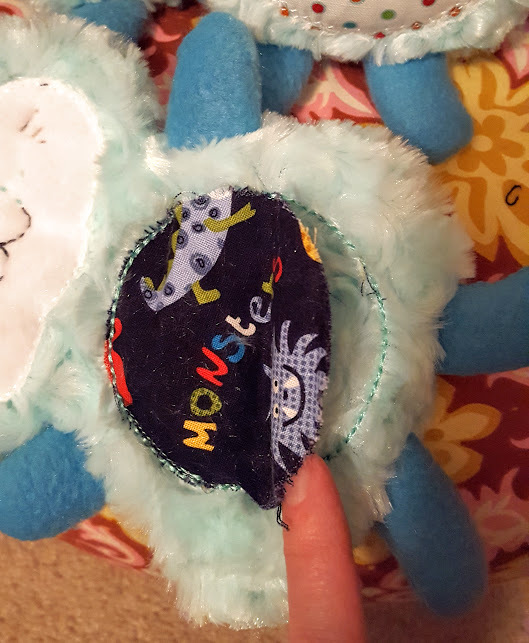 There is also some hand stitching involved, and admittedly, I am terrible at this part….. so I cheated and did it all by machine (I used the decorative stitches that have the look of hand quilting and a blanket stitch. It’s important to note that if you decide to machine stitch everything, you will need to do this step before constructing your purse). FYI, I plan on further “cheating” when it comes to the strawberry and instead of making knots with embroidery floss, I am sewing on little black beads for the seeds! You can pick up hardware kits (that contain 3 flex frames and O-rings) in Betz’s Shop as well as a wool felt kit (wool felt doesn’t just sew nicer than craft felt, it holds up substantially better too) to make all 3 designs. This entry was posted in Uncategorized on March 22, 2016 by stacy. Every spring break, think to myself, “I’m going to be so productive this week.” Of course, that never happens. However, over this past vacation, I did manage to tackle a project that has been rolling around in my head for almost two years – a seamless Lady Skater. Last week, I mentioned that I morphed the pattern together and I finally had the chance to test it out. The photo on the left is my end result. My thoughts? Meh, it just feels like an ordinary dress. 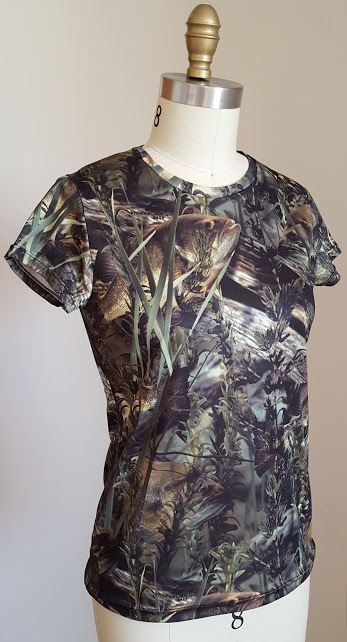 I like the fact that the bottom is ‘swishy’-er than most and that the pattern no longer breaks up the print, but I didn’t create anything earth-shattering by morphing the top and skirt portion together…. in fact, now that it’s finished, I’m wishing that the skirt was somehow fuller and the bodice was a bit more fitted (I do blame the material for the less fitted look – it is extremely stretchy and drapy which I believe changes the fit of this dress some). I will keep this (morphed) pattern on hand for times when I need a quick knit dress and want to use a print, but I don’t think this will be my ‘go to’ pattern. One thing I should mention if you decide to do this yourself, is that you’ll need more material than the original instructions call for – probably 2 1/2-3 yards depending on your size. This entry was posted in Uncategorized on March 21, 2016 by stacy. Check out these cool new gadgets from Dritz and enter to win some too! Wrap dresses are definitely a classic style. Grab your free pattern to make one here. Sewing doesn’t have to be complicated. He’res a tutorial (you’ll may need it translated) for creating a cute vest from a triangle. Spring may start this weekend, but apparently Mother Nature didn’t get the message. If you’re still needing warmer clothes, be sure to check out this tutorial for this sweater dress. Of course, if you’re lucky enough to have warm weather, be sure to check out this fun, Peek-a-boo t-shirt. There’s still plenty of time to decorate for Easter. This adorable Patchwork Peter Rabbit or this amazing free motion quilted version would be a great addition to any home. Everyone loves little bags. This triangle version is definitely a different take on small pouches. Potholders never big enough for your needs? Then whip up this large version for you next dinner! Of course, if you don’t mind something smaller, this camper hot pad is simply adorable. Whether you’re hitting the gym to work out or just getting ready for summer temps, these Women’s Gym Shorts are a great addition to any wardrobe. This entry was posted in Uncategorized on March 17, 2016 by stacy. It’s not Thursday (so not really my linky day), but thought that I would point out that for TODAY ONLY you can pick up this adorable Archer Bunny pattern for free (guess what I’ll be trying to squeeze into my plans this week?). He’s perfect for stuffing into baskets this Easter…. or just because! So hurry over and snag your pattern this morning – he goes on sale in her pattern shop tomorrow. This entry was posted in Uncategorized on March 16, 2016 by stacy.